How to Get Startup Ideas? 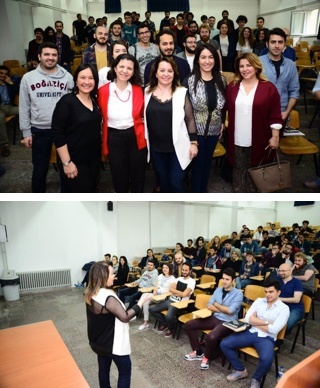 In this seminar, Mine Tozlu, who is an entrepreneur in both online and offline businesses, gave a speech about finding out new but applicable business ideas. She is the founder of famous web sites such as mumine.com, and she has been the CEO of MT Marka, Proje Danışmanlığı ve İşletmeciliği A.Ş. She has been the idea-owner of a new financial tool namely, esthetics & beauty credit, in which MT company has been cooperated with Denizbank. She talked about the challenges as well as gains of being a venture capitalist. The seminar was open to all of the Boğaziçi University students as well as the academic staff. The seminar was held in Turkish and there were approximately 80 participants, who were benefited from this topical event. This event was announced in several business magazines such as Class Magazine and HT Magazine, which increases the awareness about ISRC in different platforms.